The Ca?on del Colorado was to be the place where we were going to spend the night, in a cool cedar environment. 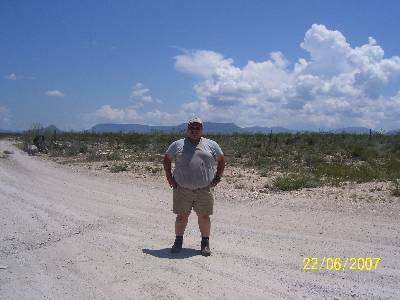 There were plenty of areas to set up camp, but given my truck problems we had to whizz across the Ca?on as fast as possible. The smells of the Canyon were awsome , and the views from the ground up were spectacular. that's too bad about your truck :9 i'm glad you got to continue on, i can't wait to hear about the rest of the story! We passed thru Ejido Carranza, but our ligistics failed. 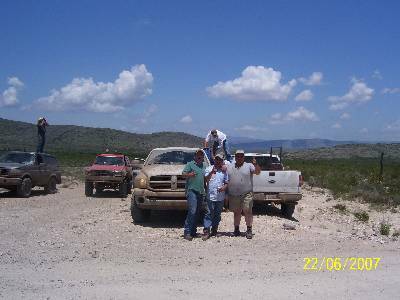 This was not the fork on the road, they (Sabinas 4x4) could not have deviated from the course of the road and come here, it would be illogical to do this. 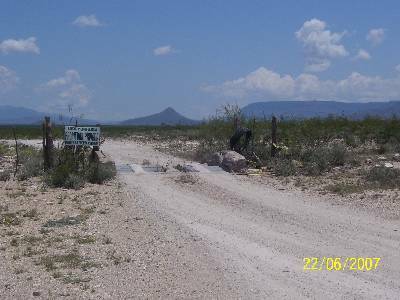 The place where we would see them would be El Paso de Las Cabras , it was a place where you had to come thru if you were coming from Muzquiz and El Melon and turn towards La Linda. It was hot there, almost over 110?F...but to me it was: HELL !!! Scorching was an understatement, it was hot but we could see more than 10 kilometers in either direction, if they were coming we would se them from a far. And i had left my sunglasses at my truck, what a time to remember that. I laugh now, but there i could not keep my eyes open from the reflection of the sun on the ground. You were missed Viper, everybody was asking for you, i told them about your job opportunity. They understood. I'll try to be good . . . but do not diddle too long or I'll start guessing! So we were there, no shade , bearing the heat and making time for our friends to come there and meet them. I was starting to grow impatient.... I knew i was NOT alone. :? I took the opportunity to snap some pics for you guys, my boots were cooking my feet and eventhough i was wearing shorts , it was not enough. It was boiling hot...2 o'clock in the afternoon. 115?F ....HELL ON EARTH !!! 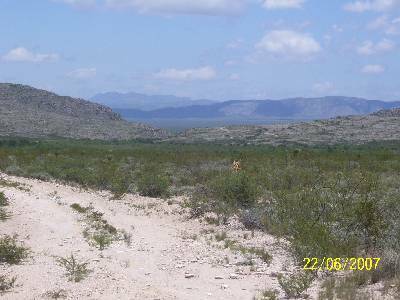 I went up to this hill, to maybe see more far away..i was hoping to get some dust trail, some hint that they were coming to us...NADA !! 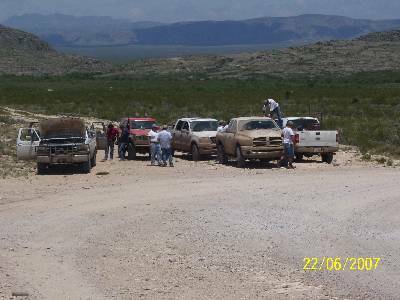 Well as soon as i came down, the fellas approach me and ask me what should we do?, keep on waiting or should we push forward ith our planned trail ride? 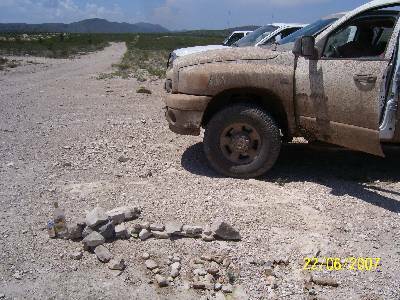 , hoping that they (Sabinas 4x4) would do the same . This would mean waiting another 2 more hours, loose precious time, daylight more important and move on. Not many options to consider: On I said, we have to make for the time lost. 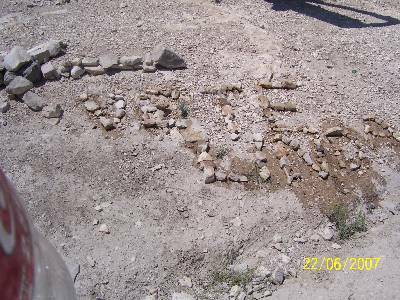 But we left them a rock sign, Impossible for them not to see it. It read: Sabinas 4x4...Acu?a Extremo: Go to Linda. Left a couple of empty Bottles , plus a carton sign. 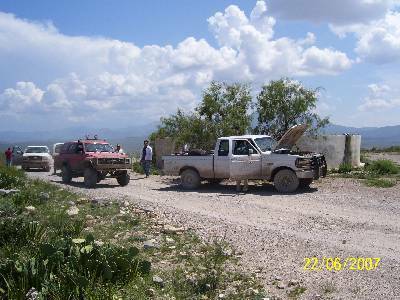 A truck trailer that was heading for AguaChile mine, stop with us and we asked him if had seen anybody coming this road, he said no one. We had to push forward, they were another big group, experinced as well. If were going to meet, it would have to be in La Linda. No other place left. More tomorrow, folks I have to go to sleep... .Tomorrow the mines: Pictures & Videos. Well I'm back, sorry to keep you all waiting..moving right along. 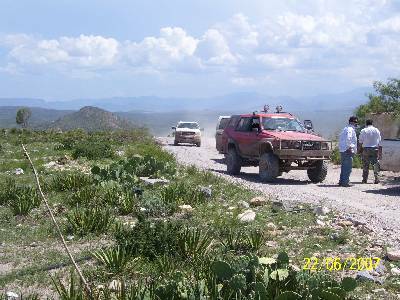 We got on the move having in sight to reach the Cuatro Palmas Mine, still we were kind of weery not being able to see our friends from Sabinas. We stumble with this big watering pool the locals use to water their cattle along the road. Megalo77, being thru that palce many times before said, it could be a good place to wait for the other fellas, so we took the opportunity to cool down a little bit , after going thru the Puerta de Las Cabras, which was hot like hell there. At least the winds were blowing a little cooler here. 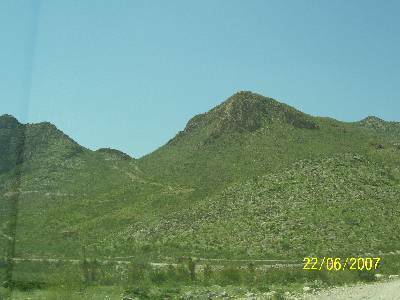 After he decided to wait for them, We saw this interesting hill , until the time we did not it's name. 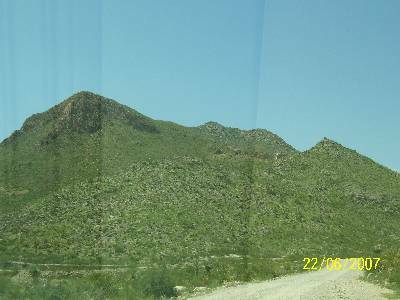 It so happens to be the name of the mine we stumble upon: Mount Aguachile. 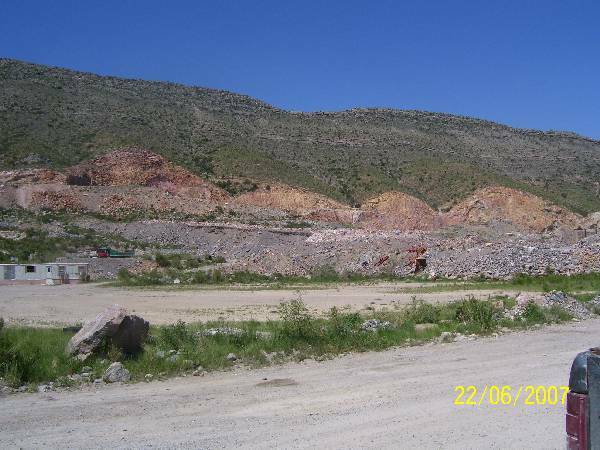 Agua Chile is a mine that is nestle on the grounds of this semicircular crater like ridge which is full of Fluorite,this mineral was the one that was processed in La Linda, in it's heydays and the main source to mine it was the 4 Palmas Mine. Still it was tempting to see it and not investigate it, while we were there. We had to go and see. Megalo77 decided to wait, check it's truck . It started to present , also, mechanical problems but he did not wanted to tell us until he checked it out thouroughly. Looks like the trip is taking its toll on the older Ford trucks . . .
We took off to see this place, still not knowing where we were headed. It was an adrenaline rush just to be where you had no idea where were you going...Oh, the adventure !! 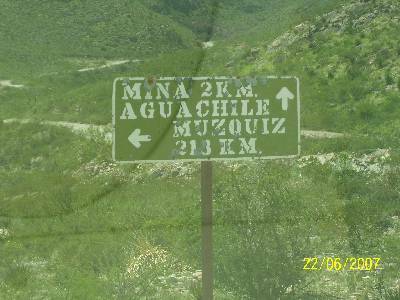 We saw this sign that read: Mina Aguachile 2 km...straight up. Muzquiz 213 kms. We looked at each other, eyes staring at each other: what the hell !, were here right?.....lets go for broke, everybody !!! We went on.....God knows where we were going, not us. Our nerves were like glass, brittle to the first reaction. LETS GO !! hahahaha...it was NOT a good day for Ford. 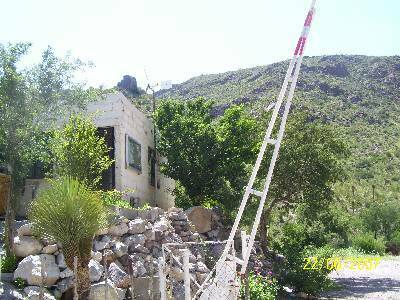 So we stopped , and i took the opportunity to catch one of my favorite mountainside: Maderas Del Carmen. I love this as a backdrop of a fantastic mountain side view. We came upon the maingate, where Don Gilberto was the gate keeper. Time to get off the truck and negotiate our entry, being out here. Nobody coming at all, for nothing I thought it would not be difficult...luckily for me , it was not. Nothing two cans of Tecate Light could not handle. We went on...interesting to see how they carved the inner part of the mountain to make way for the cargo trucks to go in and out. Then , it opened up....a whole stadium like sorrounding, there were many operations going on. Stone pickers, Low end Front loaders, Truck Hoppers, Mineral breakers,a mill....many operations. 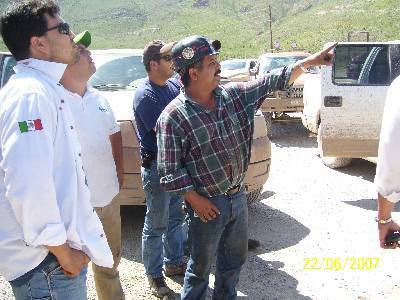 We had to get a final say from the Mine superintendent: Don Pepe. He was nowhere in sight. :? Where else could he be?, we had to get out and look for him. 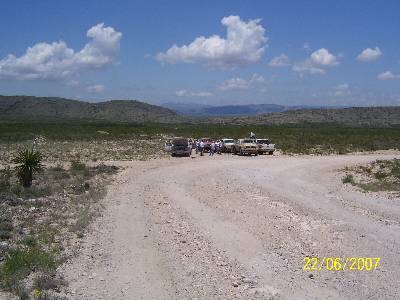 The people were stranged to see us folks coming from so far away in to the mine site. We found him. 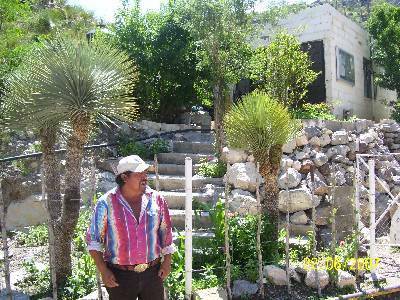 Don Pepe, as he is know by his coworkers, named Servando Rodriguez, a real nice kind of guy. 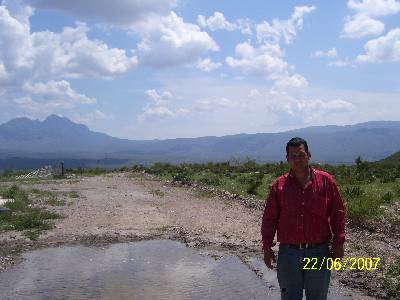 Very well mannered, very well educated, he was the superintendent of the Minera Muzquiz's Agua Chile Mine. 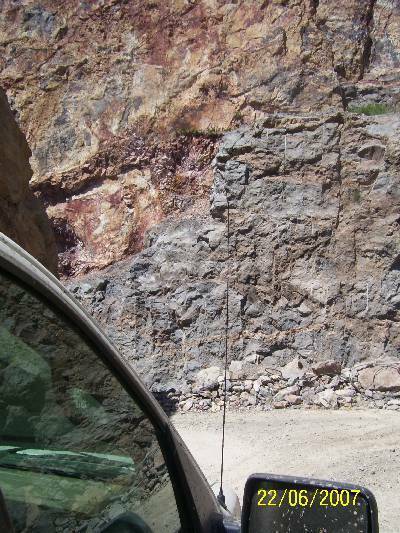 We identified ourselves, explained who we were , what were we doing there and our interest to know the mine. The coin was up in the air, we could have gotten kicked out of the premises or gotten the v.i.p. tour. We got the latter.....Thank God !!! Well before he took us to the mine site, he explained a little bit of the company was mining the mountainside in a gap like mining carving, very unique.